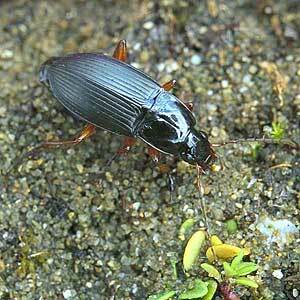 Description: 10-14mm long black ground beetle of dry open ground, including gardens and arable land. Generally common. World Distribution: A European temperate species (73) distributed across most of Europe to north Africa, Asia Minor and the Caucasus. Irish Status: Widely distributed in dryish terrain. Ecology: A eurytopic but moderately xerophilous species in Ireland. There is a spread of records for well-drained agricultural land, but it is most often recorded from dry coastal dunes and heaths.